Two stories in one day which you would expect to disrupt the faux-anti-imperialist narrative, but which probably won’t. Narratives stand high above facts, after all. First, ISIS claims responsibility for a suicide attack which killed Saudi soldiers in Aden, Yemen. UPDATE: My friend Elizabeth Tsurkov says this: “Israel is simply ensuring that it can bomb Hizbollah/Iranian targets without being shot down by Russian jets of S-300 systems. There’s no indication anywhere that Israel is sharing intel with the Russian regime on this issue. … Middle East Monitor is a site that it known to fabricate stories.” She may well be right about the source, and about the intelligence sharing. But Russian-Israeli military cooperation is increasing, not only in Syria. Mainstream and leftist opinion – often guided by a cabal of ageing orientalist white men (Cockburn, Fisk, Bromwich, Glass, etc) – will continue to hold that Saudi Arabia controls ISIS and Russia is lined up with Assad and Iran in a confrontation against the Zionist West, which is intent on Assad’s downfall. These useful idiots are smoothing the way for the fascist-imperialist axis. Meanwhile Russian fire falls on Syria’s liberated cities, striking the Free Army in Homs and Jaysh al-Fateh in Idlib, Hama and Lattakia, striking also buildings used by self-organising civilian revolutionary committees and Byzantine ruins outside Kafranbel. Dozens of civilians have been murdered. 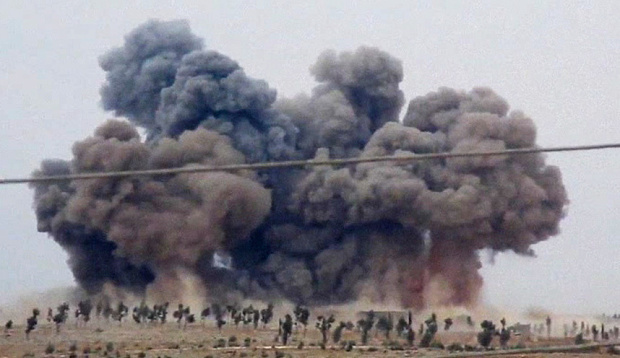 One in twenty of Russia’s strikes have targetted ISIS. It seems regime/ Iranian ground offensives will follow, particularly in northern Homs and the areas of Hama and Lattakia near the regime’s coastal stronghold. The aim is to shore up Assad’s collapsing regime in the fifth of Syria he retains. The larger hope is to destroy the opposition, leaving only Assad and ISIS standing. Then the West may more openly back Assad to take the rest of the country back. The imperialist assault will undoubtedly extend the war in time and expand it in space. The coming months may see grievous setbacks for opposition forces. In the end, however, Russian bombs will not be able to alter the demographic reality any more than Assad’s bombs or the Iranian militias could before. Assad is running out of fighting men; foreign troops, however many arrive, can extend but not win his war. And not only the opposition militias but the majority of the Syrian people too will refuse to cooperate with any plan envisaging regime survival. For them Assad, not ISIS, is the supreme evil, and with good reason: Assad’s forces are responsible for the overwhelming majority of civilians killed and driven out. Al Jazeera’s excellent Fault Lines on the US role in the Gulf, particularly its deliberate support for the repressive Bahraini monarchy. Fault Lines’ Seb Walker travels to the Gulf to look at US policy in the region, and to explore why the United States has taken an interventionist policy in Libya, but not in Bahrain, where there has been a brutal crackdown on protesters. Why does the White House strongly back democracy in one Arab country, but not another?